I went to Barnes and Noble yet again and of course, came out with even more books. To start I got another copy of Simon Vs. the Homosapiens Agenda by Becky Albertalli, and although I have an ARC copy of this book I couldn't refuse a hardcover exclusive edition of it, I mean would you? I love this book so much and I'm so happy to have a hardcover of it now, I can't wait to reread it! Next, we have The Emperor's Blades by Brian Staveley, and all I know about this is that it has to do with the assassination of a king and his three children try to find the killer, so that's fun. I also got Seraphina by Rachel Hartman which I've been meaning to read for a while and I'm glad I finally got a copy of. It's about a girl who is half dragon I believe and her fight against those who are against her species, which sounds really good to me. Lastly, I got 1Q84 by Haruki Murakami which has a very complicated plot but is basically just like Reality but with a question mark. 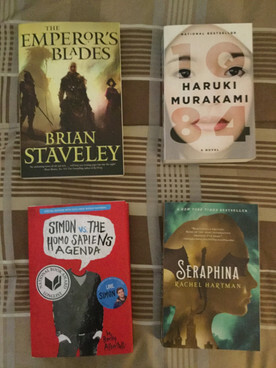 Overall I got four great books that I can't wait to read and reread!